Operating Hours: Open every day from 10am to 6pm except the 25th of December and the 1st of January. 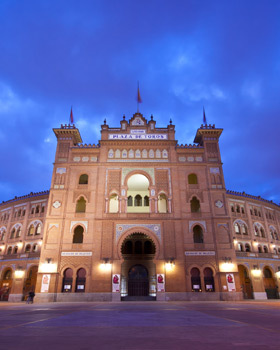 Discover the Madrid Arena, the international centre of bullfighting. On your visit with Las Ventas Tour you will discover a place which is emblematic of the heart and soul of bullfighting, where the world’s finest matadors present their artistry and skill. We will guide around the key parts of the bullring, from the main entrance, to the tendidos, to the callejón. Las Ventas Tour include the use of an audio guide available in 8 languages: Spanish, French, English, Italian, Portuguese, German, Chinese, Russian.